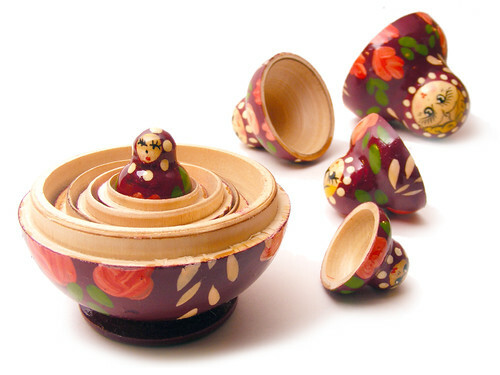 Use the Russian nesting dolls as a model for a musical composition. This assignment was made in the early evening, California time, on Thursday, June 11, 2015, with a deadline of 11:59pm wherever you are on Monday, June 15, 2015. Step 1: Consider the Russian nesting doll called the matryoshka, in which hollowed-out wooden figurines are designed to be stored inside each other, excepting the smallest doll, which is solid. Deadline: This assignment was made in the early evening, California time, on Thursday, June 11, 2015, with a deadline of 11:59pm wherever you are on Monday, June 15, 2015. Length: The length of your finished work is up to you, but between two minutes and four minutes is probably best in this context. Title/Tag: When adding your track to the Disquiet Junto group on Soundcloud.com, please include the term “disquiet0180-matryoshkamusic”in the title of your track, and as a tag for your track.